Worms will eat your garbage! Worms are one of nature’s best decomposers. After they have digested what they need, they leave behind worm castings in the soil. Millions and millions of these worm castings create compost, which is added to existing soil. While this process happens naturally outdoors, it can also happen inside your home—in a worm bin! 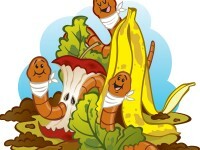 Making compost indoors with worms is called vermicomposting. All it takes are worms and a worm bin. Here is the “recipe” for creating a worm bin. 1. Get a large plastic container with a lid and poke some tiny air holes in the lid. 2. Take damp, shredded newspaper and layer it in the container until it is about three-quarters full. Then, sprinkle the newspaper with 2-3 cups of peat moss. 3. Mix it all up so that you have a container of dirty, wet newspaper. What you have just made is called “the bedding.” This “bedding” is going to be the worms’ home for the next few months. 4. Now, put food scraps, broken into small pieces, at the bottom of the bedding instead of throwing them in the garbage. This can be banana peels, apple cores, orange peels, watermelon rind, wilted lettuce leaves, egg shells, and coffee grounds. DO NOT use any meat, bones, or dairy products as they will start to smell before they decompose. 5. Finally, add 100 Red Wiggler worms (these are the best composters) and let them go to work! 6. Feed them once or twice a week (make sure the old food is gone before you add new), keep their “bedding” moist, and turn it over every so often so that air can flow through it. In about five months, you will have a container full of compost that you can use in your flower or vegetable garden. Plus, you will have reduced your waste! Thanks to the Bergen County Utilities Authority and Angela Bonanno-Lynch, Solid Waste Education/Technical Advisor, for these step-by-step instructions from their Wonderful, Working Worms! education program.